Facebook is asking all of its 350 million users to review their privacy settings after releasing new tools, tweaking the privacy settings page and doing away with regional networks. It’s the latest change to how users are able to manage privacy on Canada’s most-used social network, following a commitment the Palo Alto, Calif.-based company made to the federal Privacy Commissioner’s Office on Aug. 27. Recent changes have helped meet some of those commitments, but there’s still more to be done. Regional networks were removed because many were too large and were no longer an effective way to control privacy, explains Richard Allan, director of public policy and privacy for Facebook in Europe. Verified networks for workplaces and schools will remain. Among Facebook’s new privacy tools is a Publisher Privacy Control tool bar. Accessed by clicking on a small lock icon next to Facebook’s posting field, users will be able to select who they want to share their post with. Options include Everyone, Friends and Networks, Friends of Friends, Friends and a Custom field. Facebook’s new privacy controls tool. “Facebook will be giving more users more power, more choice, and more control over the information they post online,” says Elliot Schrage, vice-president of corporate communications and public policy at Facebook. The social networking site still hasn’t addressed the third-party applications platform. It has until Sept. 1, 2010 to implement a more granular, permissions-based system that will give users greater control over what information they share with applications installed by them and their friends. Facebook is not announcing the new applications platform at this time, Schrage confirms. But it is working with the Privacy Commissioner’s Office closely and will bring forward that new platform sometime next year. While Facebook works to improve its privacy settings, it is also attempting to make its information more searchable and real-time. It recently began indexing profile pages for search engines, and added a live news feed to the site. But competing with real-time services such as Twitter can sometimes cause friction with protecting user privacy, says Tamir Israel, staff lawyer with Canadian Internet Policy and Public Interest Clinic. The University of Ottawa-based group originally lodged the complaint that led to a privacy investigation of Facebook. Starting yesterday, Facebook users were prompted to review privacy settings just after logging into their accounts. 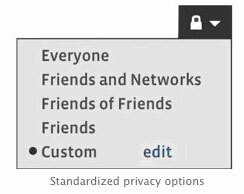 Users are presented with two options for information they post to the site – continue to use existing privacy options they’ve set, or choose the options recommended by Facebook. Information items such as About Me, Family and Relationships, Work and Education, and Posts I Create are recommended to be shared with “Everyone.” Other information items, such as phone number and address, are recommended to be shared with a smaller group of people. Facebook’s definition for “Everyone” is everyone on the Internet, not just all Facebook members. Facebook will also be making some profile information publicly available. A user’s name, picture, network and Friends list will be made public to assist those searching for specific users to add. The change is meant to solve the problem of trying to find a user with a common name, says Ana Yang, product marketing manager with Facebook. A small box in the Privacy Settings page now shows users what information is publicly available about them. “We make it very clear to the user what information of theirs will be available to each audience,” she says. It will still be possible for users to prevent their profiles from being discovered in a search, and to block messages from those not on their friends list. Facebook is also limiting the exposure of minors’ information on the site. Users under the age of 18 will have a more restricted “Everyone” setting – so only members of verified networks can see the information. The Privacy Center focuses on educating new users about how they can control and share information. A similar tool could address concerns about the third-party applications by allowing users to control information they can access, he adds. Facebook users can skip out on reviewing their privacy settings on their first visit to the site after the changes. After 24 hours grace, users will be required to review their settings.